Perth Ontario Canada - Explore Perth Ontario, the source for complete information on Perth Ontario Canada including a local business directory with hotels, restaurants, professional services and more. 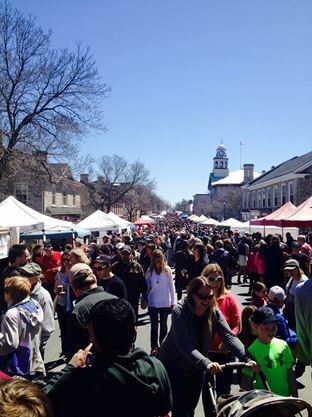 The grand finale to the month-long maple celebration takes place in downtown Perth on the last Saturday of April each year. Maple products and taffy sales displays, entertainment, midway, pony rides, petting zoo & children’s activities. Live musical entertainment over 170 Craft & Artisan Vendors Food Vendors Classic Antique Car Display. Over 20,000 visitors a year. Over 170 vendors. Perth Ontario is a place where people still stop to say hello. It's rich in art, culture and entertainment. There is beauty found everywhere you look. There is a lot to do and fun for the whole family. Some for the Perth area attractions include: The Perth Fair, The Stewart Park Festival, and The Garlic Festival. Perth is conveniently located an hour outside of Ottawa Ontario and is connected to the Rideau Waterways system through the Tay River. Escape the city and come explore Perth Ontario! If you have never been to Perth or you are a returning visitor and would like to find out about places to stay, stores to shop at and things to do, visit our Business Directory.